No good meal is complete without something sweet to finish it off. 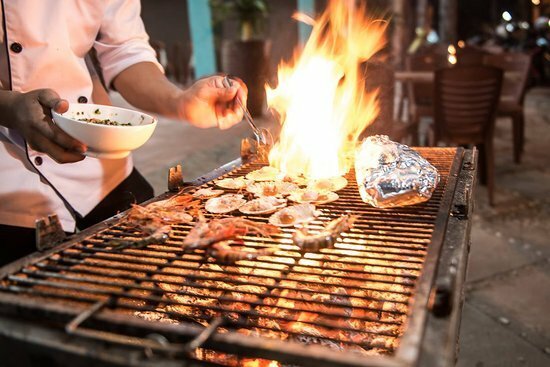 Luckily, in� Vietnam, there are a number of desserts to choose from — many with an interesting history and tradition attached. Similarly to the savoury meals made in Vietnam, the versatile rice grain makes a regular appearance. Unlike Western desserts, which use plenty of wheat flour and butter to make the likes of cakes and biscuits, the Vietnamese opt for glutinous rice and rice flour. To fill these sweets delights, cooks in Vietnam use plenty of coconut, fruits, beans and nuts — ingredients that are much more readily available than the dairy products found in the West such as chocolate or cream. Here are some of the country’s favourites, with links to the recipes included. 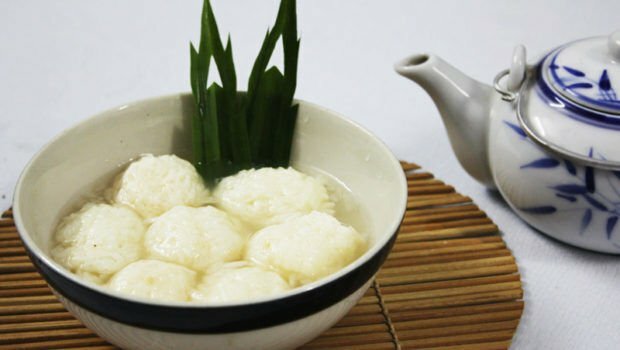 Balance of texture is a particularly important factor to building the perfect dessert in Vietnam, demonstrated through the popular sweet soup,� chè, which comes in many forms. 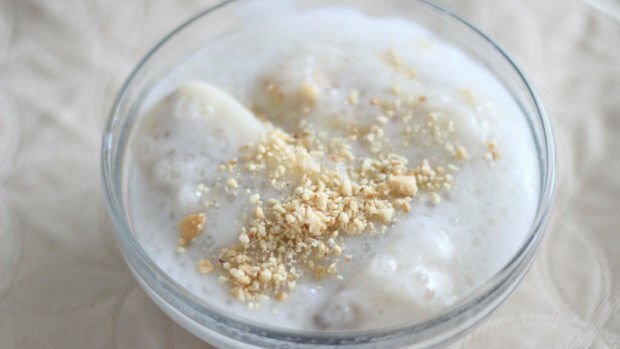 One version, known as� chè chuối, balances soft banana — cooked and served in coconut milk — with slightly chewy sago pearls (a starch extracted from the spongy centre of tropical sago palm stems) and crunchy nuts. This popular jackfruit yoghurt is another dessert that balances texture well. Colour really makes� this dessert stand out, topped with a layer of nuts and featuring colourful cubes of jelly and sago pearls. 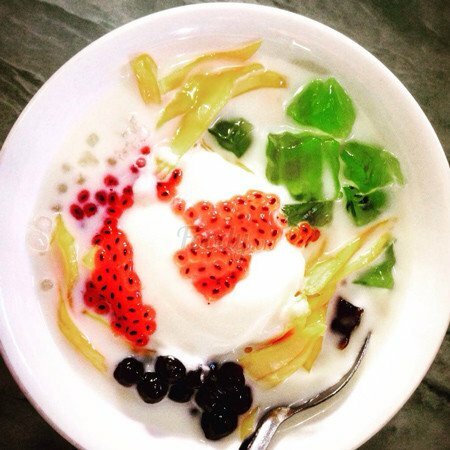 Contrasts between northern and southern Vietnam can be found in the country’s desserts. The fertile soil in the south, for example, is a perfect breeding ground for palm sugar, coconut and tropical fruit trees, which means these ingredients are more freely used. 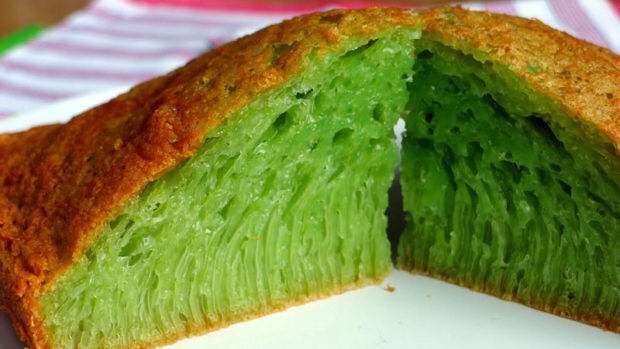 This can be seen in the southern dessert,� bánh bò nướng — a chewy coconut cake, sometimes called “honeycomb cake” in English, which is green in colour from the use of tropical pandan leaves. 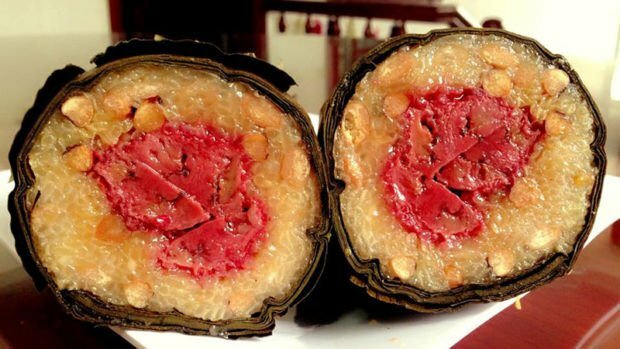 Another dessert found in the south of Vietnam is� bánh tét chuối, a sweet variation of the glutinous rice snack� bánh tét. To make it, sticky rice is flattened out on a banana leaf, topped with banana or red mung beans and rolled up. It is then cooked either on an open flame or boiled in water and is served with a custard-like sauce, sprinkled with sesame seeds. You can get� cơm rượu — a glutinous� rice wine — all across Vietnam but it varies depending what region you’re in. Generally, it’s made by mixing sweet rice balls with a milky rice wine. In the north, where it is often thicker in consistency, it is enjoyed as a pudding and called� rượu nếp. It is made by fermenting the rice with yeast and steaming it in a banana leaf. When a particular rice is used, it has a wonderful deep purple-red colour. Balance in flavour is also an important element within Vietnamese desserts, particularly between the sweet and spicy. 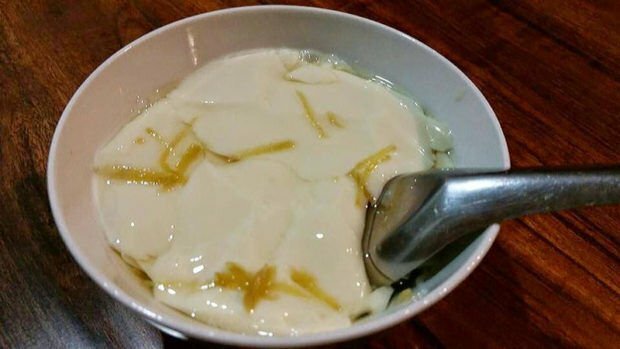 This can be seen in� tàu hũ nước đường, which is a Vietnamese silken tofu dessert. There are many variations of this pudding across Asia but what makes this dish so special in Vietnam is the use of a spicy ginger syrup that is poured over the top. It is then topped with cubes of flavoured jelly. Translating literally as ‘pig skin cake’, this� steamed layered tapioca pudding gets its name from its gelatinous appearance. 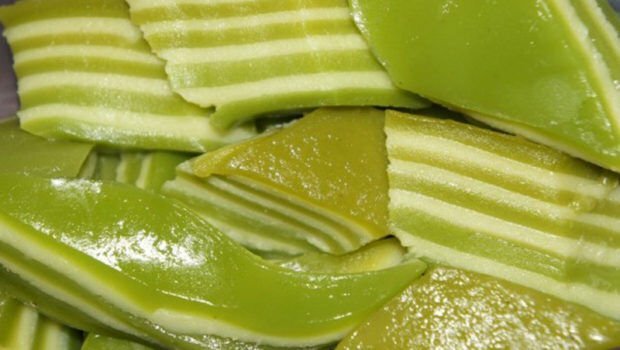 It’s made from tapioca starch, rice flour, mashed mung bean, durian, coconut water and sugar and is dyed green with pandan leaves. This is a soft and slightly chewy cake, which can be eaten on its own as well as being made on special occasions like birthdays or death anniversaries. 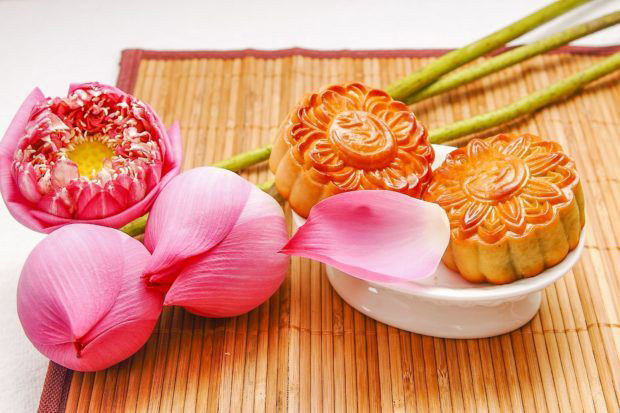 This is a traditional sweet food which is often eaten during Tet, the Lunar New Year. 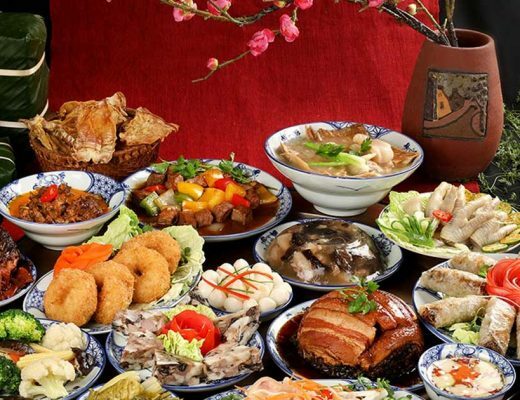 Families will offer a tray of� mứt to their ancestors because they believe it will bring them good fortune in the coming year. 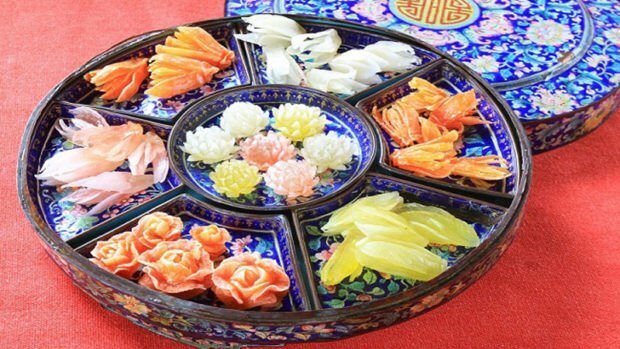 There are many different kinds of� mut tet but essentially it is candied fruit, vegetables and nuts. A tray of� mứt Tết will generally have an array of striking colours, doubling up as a decoration during the fun festivities. You won’t find whole load of desserts in Vietnam that have been fried but when you do, you are usually left with a smile on your face. These are two separate fried treats but both can be enjoyed on-the-go as a sweet street food snack. 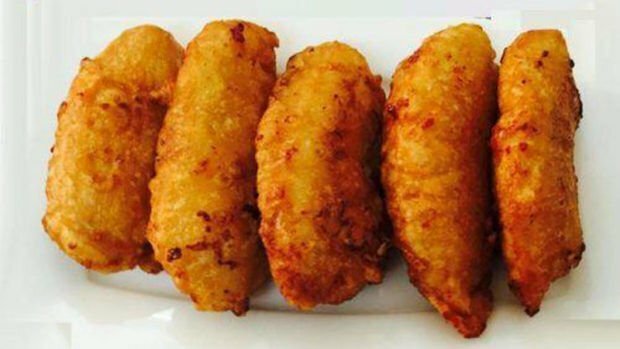 Bánh� chuối chiên is a banana fritter, which is made with a sweetened batter.� Bánh cam are sweetened and fried balls, made from rice flour and stuffed with a sweet mung bean filling. The balls are then finished with a coating of sesame seeds. 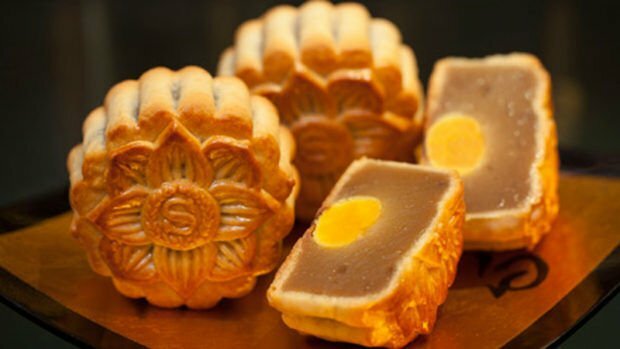 This wildly popular� Vietnamese mooncake is enjoyed during the mid-Autumnal festival season and is often given as a present to friends or family. 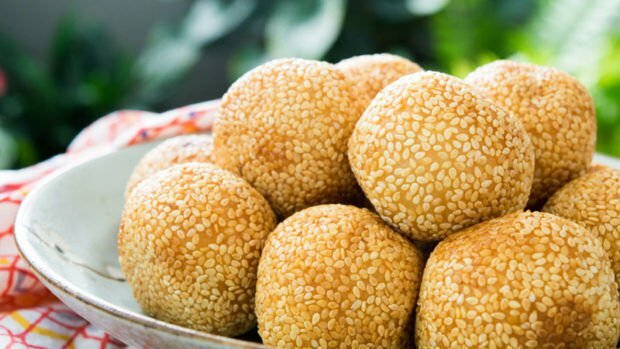 The sweet version can be made with a variety of fillings including shredded coconut, sunflower and sesame seeds and mung beans. This is then encased in a golden crust and enjoyed with a pot of tea.